After whirring themselves into a frenzy, the sewing machines of Perth fell silent last Saturday evening. 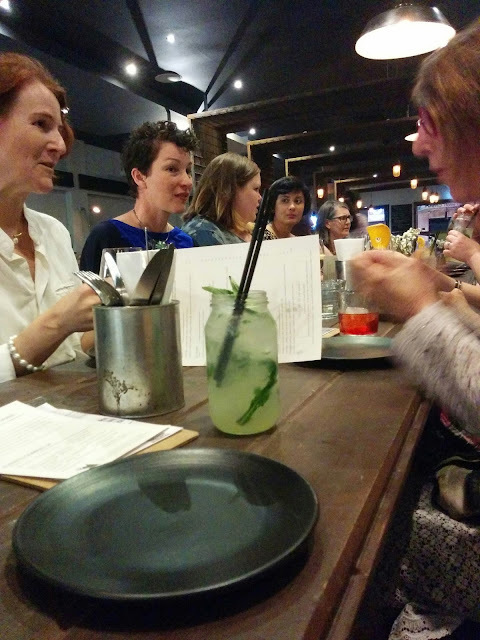 It was a very special night - the first ever Perth Frocktails - where the sewers of Perth donned their handmade best and strutted forth to meet each other in real life! There were 17 of us and it was so lovely to meet and chat about sewing without feeling like you were a total bore! It was also great fun to examine everyone's outfits and get the lowdown on their construction. We had food and cocktails and I just had the best time ever. I decided early on that if I was going to a Frocktails event (something I'd read so much about on the east Aussie blogs), then I was going to go all out and wear something a bit out of my comfort zone! I first trawled through my patterns and came up with a shortlist. Then I searched through my stash. When my hand alighted on a gold curtain from Remida (Sound of Music anyone? 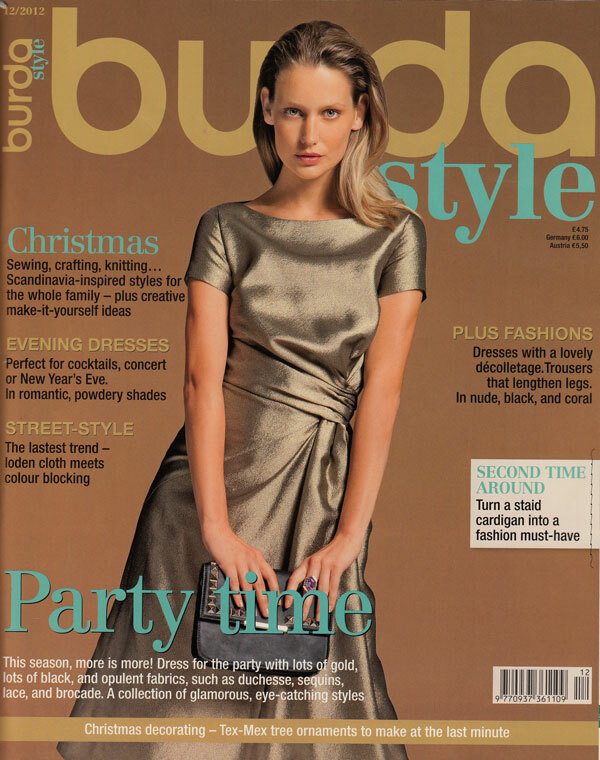 ), I knew I was going to attempt to recreate the cover of Burdastyle 12/2012 and make this asymmetrical, draped dress (#112). This was quite a challenging pattern, but luckily there was a sewing course in the magazine, which helped. Towards the end I got confused and just did my own thing. My drape doesn't quite look like Burdastyle's, despite lots of fiddling and a few invisible hand stitches. The drape on my dress seemed to emerge from the chest apex area, while the model has none of that and more of a sash effect. This served to provide me with a rather alarming bust profile when standing side-on (below). I decided to just not stand side-on. I was very disappointed to discover, after sewing my back pieces together, that the fabric had a nap. The pieces of this dress are all cut as a single layer as they are asymmetrical. I had to play with the layout to get them all on the fabric and unfortunately I cut the upper back piece facing differently to all the others. You can see how the light falls on the skirt differently to the bodice. Bummer. Still, I was glad it was only on the back. There were also a few wrinkles along the back, but it was school holidays and I had neither the time or inclination to fix them. I was just happy my invisible zip was invisible! I made the dress in a straight size 40 with no changes, so the fit was pretty darn good. I didn't have much time and got this done in two days just before the school holidays started. I hung it up for the bias cut hem to do its thing, then hemmed it by hand a few days later. Despite the issues I mentioned, I was very pleased with this dress. I love the draped part and the way the dress forms natural folds underneath that look like gathers, but aren't. It looked nice without sleeves, but I added them as the evenings are still cool here. It's hemmed to just below knee length. I didn't want to be too wild, what with wearing gold and everything! Speaking of wearing gold. I have to say, it was a bit nerve wracking, walking through the busy Saturday night crowd in this get-up. I strategically opted to arrive with Carolyn and Sue so I wouldn't feel too self conscious. Good decision. I was even more grateful to be with them when we left at midnight as some drunk bogans sewing fans in a passing car got a bit excited and propositioned us in the car park! Well, who can blame them really? Frocktails. If you haven't got it near you, book a venue and make it happen. You won't be disappointed. Thank you so much to Nat of Sew Outnumbered for taking the initiative to organise this one. It was fab. It's magnificent. You are your own gold statuette! A curtain. Who'd have thought! Oh yes, I like the idea of being a gold statuette. Thank you! Wow wee what a dress! Fabulous stuff. Generally I'm pretty pleased I live 3 hours south of Perth but would have loved to come along to this evening. Sounds like it was lots of fun. It would have been worth the trip. Stay tuned for the next one! Baby, all you need is a bag of chips because you so ALL That in that dress. Don't blame the bogans at all! Very glamorous dress and so perfect for Frocktails. Amazing that you made this from a curtain. You look fabulous! 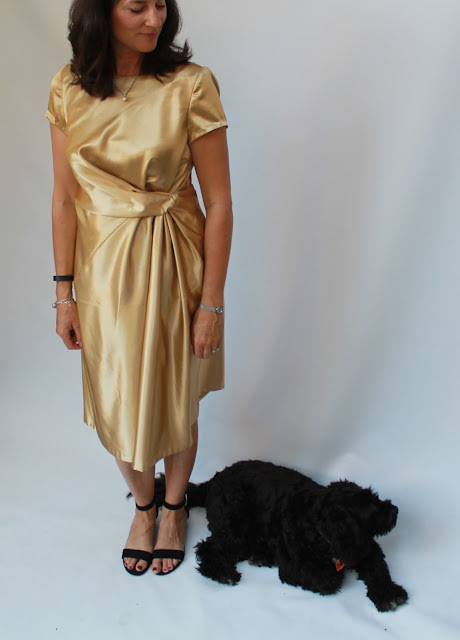 Awesome dress - if you can't wear an amazing, draped gold dress to frocktails, when can you wear it? Glad you had such a fun night, and that you left in a group! My thoughts exactly. It was fun being bold for a night! Just gorgeous! A beautiful golden goddess :) and yes, Frocktails events are amazing. So glad the West Coast has joined in! It is a fabulous dress, and I love the story of it being created from a curtain. If I can be a bit crass, you probably had the most cost effective dress of the night! Just one little thing - could you not have chosen a more flattering photo of your sewing friends? Thank you Sue and sorry about the photo. I only took two and the other was worse! BTW, I meant to say that when I saw that slightly different colour on the back I thought it was intended - for real!! Darn it, I should have pretended it was! Me too. I'm now thinking some delicate pinstripe would look very rad with this pattern! Your dress looks terrific. I also thought the back was meant to be like that and I like the contrast. Brisbane Frocktails in a couple of weeks. It's terrific fun isn't it!. Thank you. Have a great time at Brissy Frocktails! Oh wow, a curtain! I would never have guessed that! I imagine it was quite a challenge turning Burda instructions into such a complicated style. I was scratching my head trying to make sense of some of it. I couldn't have done it without the additional instructions! Fantastic dress and great night out! We are trying to put together Frocktails for Tauranga NZ. Fantastic news. I hope it works out for NZ! Great dress and great recycling! Can I ask where you got your shoes? Thank you. These are from Betts, borrowed from my sister. They were very comfortable. I hate high heels! What a beautiful pattern - I'd love a dress like that (though would chicken out at the gold but maybe pewter would work...). I loved that you were, ahem, accosted by some drive-by sewing fans! And how lovely to have all met up. I've met three sewing bloggers on two occasions over the last week and you know what? There's just never nowhere near enough time for everything you want to say and ask and hear! Pewter would be stunning and yes, I totally agree about meeting sewing people. There's way too much to discuss! Good job on the dress! Wonderfully copied I think. Here's hoping that the event goes well and that one day you can take this dress out of storage and remember the effort that you put into making it!